In 1898, the Martians tried to take over, but we got lucky and they left, died off, or whatever. Now, over thirty years later, they're back. Persistent, aren't they? We're not totally unprepared. Aetherium, commonly called the Martian metal, has altered some folks and given them the power to fight back. While most of them live on the fringes, we need each and every one of them if we're going to keep them from taking over. Aren't we? You're guaranteed to make a fantastic guy or gal right outta the gate. This is high-powered pulp, and we aim to deliver onm that promise. You can make any kind of hero you can think of, be it a masked vigilante, a mighty magician, or a scientist with his robot companion. The emphasis is on versatility, and eliminating rank requirements goes a long way to accomplish this goal. You might think it's crazy,and it is (crazy fun)! We've got you covered. In addition to lots of tips and tricks accumulated over a lifetime, you'll be prepared for anything the players throw at you. Unfamiliar with pulp tropes? We've got you covered as well by taking you through various genre conventions and explaining how to incorporate them into your game. The plot point campaign and side treks should keep your heroes busy for a long time, but if you couple them with our critically acclaimed adventure generators, you'll be having two-fisted fun in no time. This is a massive twelve part campaign taking the heroes around the globe and even above it. 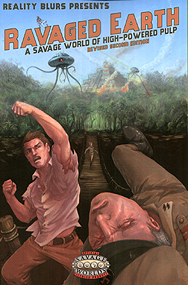 In it, you will brave hidden temples and dank castles, confront Martian tripods and more, all in proper pulp fashion. Oh yeah, you'll likely trade bullets with gangsters and blows with Nazis. It's all in a day's work for a hero like you to save the world from the Martian Invasion!